"The India-Japan Special Global Partnership and the United States"
India attracts increasingly more people from Japan, especially since Abe came to power in December 2012, determined to further develop the Indo-Japan relationship from earlier attempts. Both former prime ministers Noda Yoshihiko and Man Mohan Singh were leaders of political parties unable to galvanize support for a special relationship with each other’s country. They had to contend with serious domestic problems that hampered such opportunities, like Noda Yoshihiko’s decision to dissolve the Diet on November 16, 2012 that postponed the scheduled annual summit that Man Mohan Singh was prepared to attend. The India-Japan Global Partnership could not be furthered without stable governments in both countries. However, the LDP electoral victory in December 2014 gives Abe as much as four more years to pursue his goals with little opposition or distractions. Modi’s general election victory in April-May 2014 leaves the BJP with a clear majority in Lok Sabha, the lower house of Parliament. Leaders now have the political security for a breakthrough in relations. The two leaders have kept in close contact, meeting in Brisbane at the G20 summit. After the general elections in Japan, Modi even called to congratulate Abe on December 17. Momentum that was generated at the G4 ministerial-level meeting of Brazil, Germany, India, and Japan on September 25 in New York continued into the eighth Japan-India Foreign Ministers’ Strategic Dialogue with Sushma Suwaraj and Kishida Fumio on January 17. Do Abe and Modi Share the Same Dream? There are several reasons for Abe’s passion toward India. First, he aims to strengthen the security position of Japan by making India a reliable strategic partner, especially in regards to restraining China. Security cooperation began in the Indian Ocean, dealing with piracy and other criminal activities. In 2006, Aso Taro, Minister for Foreign Affairs in the first Abe cabinet, proposed the “Arc of Freedom and Prosperity, Japan’s Expanding Diplomatic Horizons” as a new strategic framework in the Asia-Pacific Region to link four democratic countries—Japan, the United States, Australia, and India. The target was to contain China. In accordance with this objective, Abe puts great emphasis now on cooperation between two Asian democracies, Japan and India. Second, Abe sees India as a promising partner to boost the growth of Japan’s economy. Abenomics can go together with “Modinomics.” Historically, the economies of the two countries had little overlap, even after the collapse of Soviet Union and the end of Indian socialism in 1991. India’s economy was slow to take off, and when India tested a nuclear weapon in 1998, Japan imposed sanctions against it. Japan’s delay allowed China’s trade with India to grow rapidly, making it the largest trading partner. Abe is intent on changing the balance, even as he reduces economic dependency on China. Third, Abe believes that India has a crucial position in the history of Japan. Aside from the old history of Buddhism and cultural transfer from South Asia, Abe is much more interested in modern history. Many nationalists, especially Bengalis, came to Japan in the early twentieth century, including Rabindranath Tagore. During the Second World War, Subhas Chandra Bose, a nationalist hero from Kolkata, tried to fight against the British in alliance with imperial Japan. In 1946, Judge Radhabinod Pal from Kolkata was appointed to the Tokyo War Crimes Tribunal. He is appreciated, especially by Japanese right wingers, since he was critical of the judgment of the US-led lawyers. He pointed out that the winner of war should not rule over the loser. When Abe visited India for the first time as prime minister in August 2007, he spent time in Kolkata with the families of Subhas Chandra Bose and Judge Pal. Abe’s political investment in Japan’s history arguably stems from his personal attachment to the issue. His grandfather, Kishi Nobusuke, was found to be a Class-A War Criminal and put in Sugamo Prison in Tokyo, although he was released in 1948. When India and Japan signed a peace treaty in 1952, India was one of the first countries in Asia to establish diplomatic relations with postwar Japan. Some of Abe’s passions are shared by the nation at large. Facing the general tendency of Japan’s decline, the rise of China, severe diplomatic tensions in East Asia, and assertive voices of nationalist sentiment, many Japanese feel isolated in Asia and welcome building a special partnership with India. Raja Mohan said, “Unlike East Asian countries, there is no historical baggage between India and Japan.” It is easy for policy makers to talk about the future. India Balancing Japan and China? Man Mohan Singh made serious efforts to construct a good relationship between India and Japan. As a distinguished economist, he had a long career working with the Reserve Bank of India and the Planning Commission of India, and was known to be an admirer of Japan’s model of development. Modi similarly respects Japan’s model. He visited in 2007 and 2012 as chief minister of Gujarat to appeal for investment, and has friends among business leaders, including Suzuki Osamu, CEO of Suzuki Motor Company. Gujarati are known for their talent in commerce and industry. Modi himself was said to be a chai-wala when he was young, selling small cups of tea on the street to help his mother. As chief minister of Gujarat, he invited investment from India and abroad, building infrastructure and achieving a 10 percent growth rate in the 2000s. In his election campaign, Modi and his party asked voters if they would vote for the “Gujarati Model.” The Indian economy has slowed since 2008, with GDP growth below 5 percent in 2013-2014. At the Nikkei symposium on September 2, 2014, Modi declared “Make in India,” in Hindi. Accordingly, he wants to utilize Japanese capital and technology to make India an industrial country. Japan has special items and technologies to sell to India, e.g. nuclear energy plants, amphibious aircraft for maritime security, and its bullet train. However, there are challenges to overcome: the Fukushima Daiichi nuclear accident in 2011 and tight nuclear energy safeguards, the three principles on arms exports of postwar Japan, and the cost and conditions of a bullet train project. If Japan takes too long to meet India’s conditions, South Korea or China will step in. South Korea has been aggressively promoting its nuclear plants and technology, and Xi Jinping has proposed Chinese investment in Modi’s project to modernize the Indian Railway. The Financial Express reported on January 31, “While Japan may have bagged the Mumbai-Ahmedabad bullet train project, Chinese officials have evinced interest in Chennai and Bangalore and Bangalore-Mumbai corridors to build high-speed trains.” Competition among China, South Korea, and Japan for project bids is economically advantageous to India—a fact that Modi is fully aware of given his upbringing in a bazaar. China has been India’s primary threat from the north since the Sino-India War in 1962, when the Indian Army was defeated by the PLA. There are disputed territories in the region of Jammu and Kashmir in the west and Arunachal Pradesh in the east, despite an agreement in the 1990s to respect the lines of control of those territories. In his youth, Modi was a former leader of RSS (Rashtriya Swayamsevak Sangh, the National Volunteer Organization), the Hindu Right Group, which claims the disputed territories as a part of Great Hindu Rashtra, Hindu State. Accordingly, when Xi Jinping arrived in India after the PLA had intruded into Indian controlled territories, Modi directly made known his displeasure. Recently, India is also threatened by China’s expanding sphere of influence southward in the Indian Ocean (the String of Pearls). While Pakistan and Myanmar have always been seen as close to China since the Cold War, Sri Lanka and Bangladesh recently also increased their reliance on China, receiving generous financial assistance to build new ports, airports, and roads or to modernize their armed forces. The slogans of Xi Jinping, the “China Dream” and “21st Century Maritime Silk Road,” are understood to echo expansive ambitions in the wider region from Asia to Africa. As India finds herself encircled by China and South Asian neighbors friendly to China, it is determined to strengthen her naval capability through new strategic directions. These include Modi’s diplomatic efforts to restore India’s relationship with neighboring countries through his early visits to Bhutan and Nepal. However, given Modi’s prime goal of economic growth, India still needs China as the economic giant next door. Moreover, although India has been increasing its expenditures on a military built-up, another Sino-India War over the border territories would have devastating effects. As such, pursuing strategic collaboration with the United States and Japan strengthens India in facing the rise of China. One Indian diplomat once frankly commented that as long as Chinese eyes are fixed on the international tensions over the islands in the East China Sea or South China Sea, India will be able to take advantage of keeping the status quo with China in South Asia and the Indian Ocean. Is the Obama-Modi Summit a Plus for Japan? During Obama’s visit from January 25-27, he and Modi issued a joint statement, which aims for close collaboration in security as well as in economics. Obama’s big smile and warm embrace were reciprocated in Modi’s effusive hospitality. Their personal ties added impetus to a special partnership to strengthen the strategic and economic ties between their two countries. Obama also held meetings with business leaders during this second visit of his presidency just four months after Modi had visited Washington. Obama visit to India coincided with the headline issue of a Japanese journalist kidnapped by ISIS. Despite this, mainstream Japanese media reported on the importance of this visit. With a full-page advertisement of the Republic Day of India by the Embassy of India, the Japan-India Association, the Indian Commerce and Industry Association of Japan, and other concerned associations and companies, Asahi Shimbun had two articles devoted to the Indo-US summit. On the nuclear deal between the two countries, “India wants to import nuclear energy plants from the US; in return, India has promised to cooperate with US policies to prevent global warming,” read one article. To face China’s advance in the South China Sea, the US and India have agreed to collaborative efforts on maritime security and confirmed a plan to hold a US-Japan-India trilateral ministerial meeting at the end of 2015, read another. Asahi Shimbun quoted the words of Siddharth Varadarajan that “Modi would be friendly enough toward China, since India cannot compete with China militarily and she needs good economic cooperation with China.” Therefore, although the United States would like to get Indian support to contain China, India may put other concerns first. Obama’s speech on peace and Mahatma Gandhi in New Delhi was also emphasized. It was worth reporting that Modi, praised Mahatma Gandhi, who introduced the idea of non-violent civil disobedience to the Civil Rights Movement led by Martin Luther King. Nikkei Shimbun reported on January 26 about the US-India Joint Statement in more detail. In the field of security, it covered anti-terrorist strategies, collaboration of defense industries, and maritime security in the Indian Ocean with the purpose of containing China in this region. On the nuclear front, this summit advanced the previous nuclear deal, which had been stagnant, and the United States promised to export nuclear power plants and technology with a scheme for insurance in case of an accident, for which India will pass new legislation. Nikkei devoted more words to politics and security than to the economy. Still, the evening edition of January 27 covered Obama’s announcement of USD 4 billion in initiatives and trade missions to help boost infrastructure. NHK world maintains a database of reports about the Indian economy, including interviews with Raghuram Rajan, governor of the Reserve Bank of India and Ratan Naval Tata, chairman emeritus of Tata Sons. To keep “Abenomics” going, Japan needs profitable opportunities in new frontiers. India is believed to be one. In November 2014, Nera Gupta of the New Delhi office reported on “Modi’s Economic Policies in Practice,” quoting the comments of key persons on signs of change. Ayukawa Kenichi, CEO of Maruti Suzuki, said, “India’s economy has been improving. More and more people are hoping to upgrade their cars. These are the customers we intend to attract.” In October, a task force, “Japan Plus,” headed by a Japanese citizen was set up by the government in India. 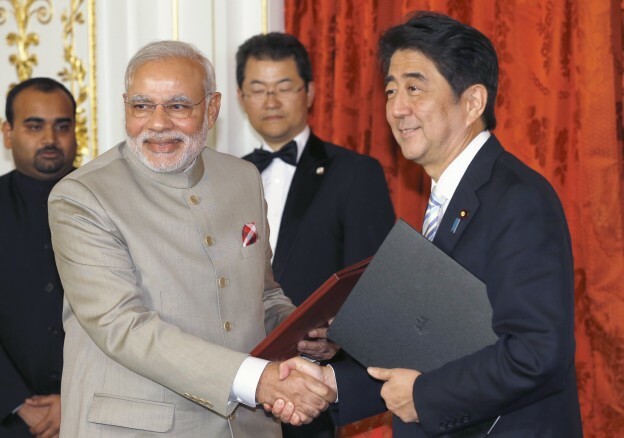 Modi had promised Abe to overcome administrative difficulties for Japanese business. “Government officials accept my request as part of a project started by Modi. I believe this makes a big difference. My main role is to draw support from the Indian government,” Toyofuku Kenichiro of Japan Plus commented. Because of the extreme volatility of global politics and economics, there is a great need for political stability and effective leadership to manage economic growth. Modi and Abe have a lot in common in satisfying these conditions. They can count on strong support from the public, as they commit themselves to lead a growth economy and keep peace and security for their nation. India is still a very new and unknown country to most Japanese, but because of this, it has promise as a new hope for Japan, which has been straggling diplomatically and economically for years. If the India-Japan Special Global Partnership could be advanced by bringing the United States, Australia, ASEAN and other countries together, the Japanese public sees the promise of a solid foundation to make the Asia-Pacific region peaceful and prosperous beyond dangerous power politics.